Art ‘N Soul is Peoria’s premiere “Paint and Sip” art studio. We provide a fun and relaxing atmosphere for an exciting social experience. Guests get their creative juices flowing as a processional art instructor gives step by step instruction through a 2 hour class. There will be music playing throughout the studio, and yes we take requests! Guests are also encouraged to bring their favorite snacks, cupcakes, wine, beer, non-alcoholic beverages, etc. 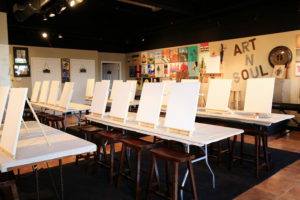 All art supplies are included such as paint, canvases, brushes, easels, and aprons. Feel free to customize the color and effects of your canvas! You can make it your own, or do it exactly like the canvas on display. NO EXPERIENCE necessary! Let the creative juices start flowing! Have fun!